One of our primary considerations when designing our 1600 sf. sustainable Haven™ was to maximize the potential of all the space we have to create an abundant amount of storage area. The space enclosed within our “shell” includes, as in any home, areas that are considered “non-living” space. Conventional homes have large “attic” areas. This space is usually not insulated. The insulation sits just above the ceiling. Because of that, attics are very hot in the summer and cold in the winter. 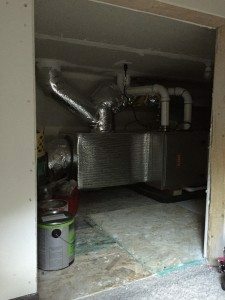 Not at all ideal space for storage unless the space is specifically built for that purpose and can be insulated and temperature controlled. bedroom and downstairs rooms,the temperature is always as comfortable as the rest of the Haven™ . 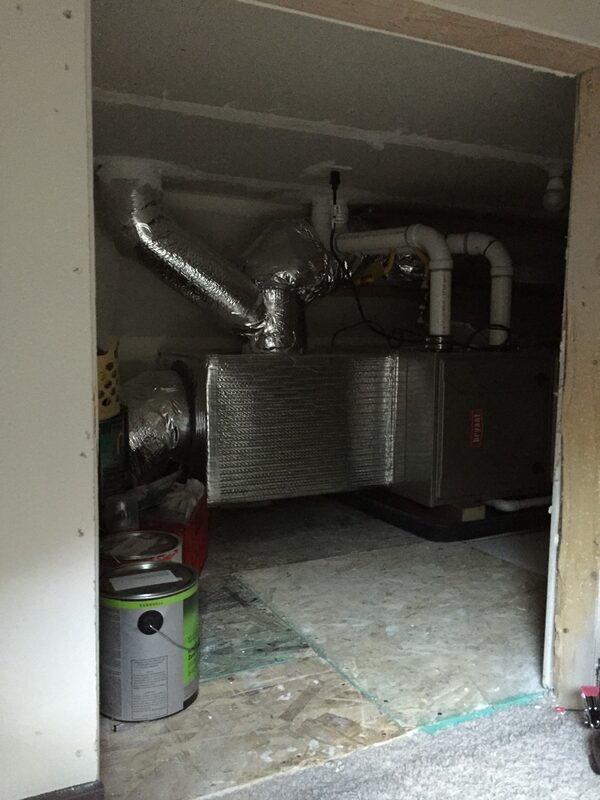 We’re able to keep the furnace in that space, most of our water heater, and cabinets that back into it from several rooms in the home. 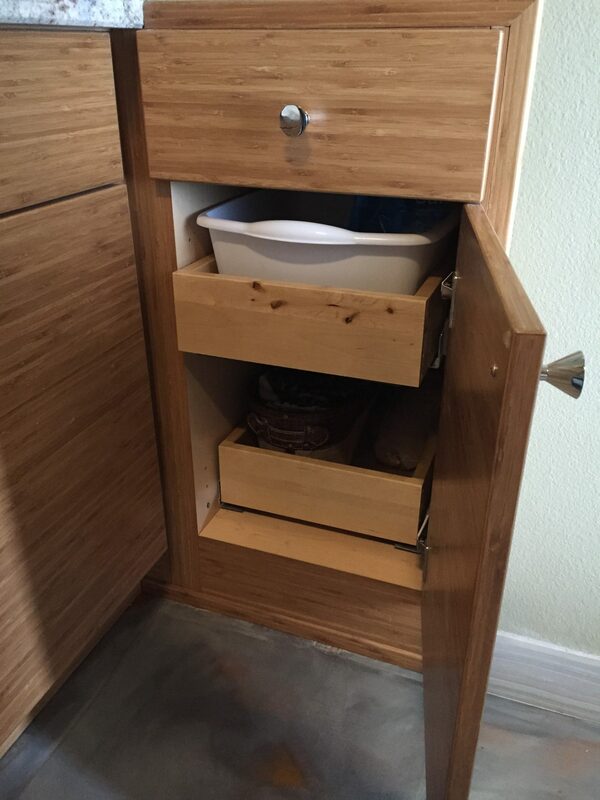 A substantial amount of that area is just great additional storage space. 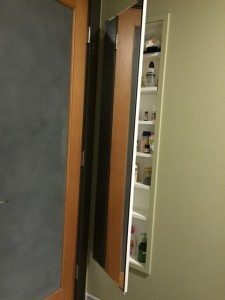 In addition, we found it rather simple to create more usable storage space throughout the home, such as built in storage, cubbies, and closets. In the photos that have been taken of our Haven model, it’s hard to visualize this substantial closet and storage space that’s tucked in all over the home. 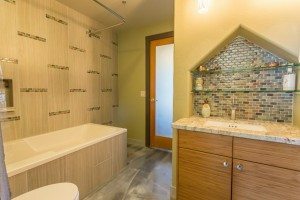 In the downstairs bathroom, we pushed the counter back about 6″ into the space that is a coat closet under the stairs to allow a comfortable amount of walking space between the sink vanity and the toilet. Conventional counter space is in short supply. We created some additional “counter” space by adding glass shelves into what is now an interesting architectural feature and offers plenty of space to put the stuff that’s nice to have easy access to, without looking cluttered! 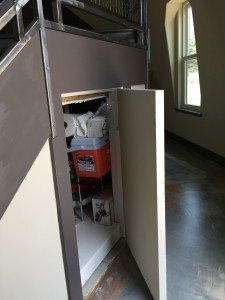 Storage cabinet using under stair space. 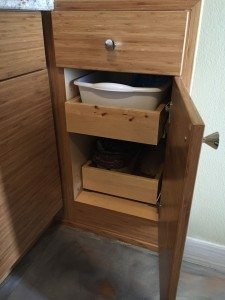 Under another section of the stairs, we were able to add a cabinet that offers a drawer and pull out shelving; creating more storage for the users of this sink than will be found in most conventional guest baths. 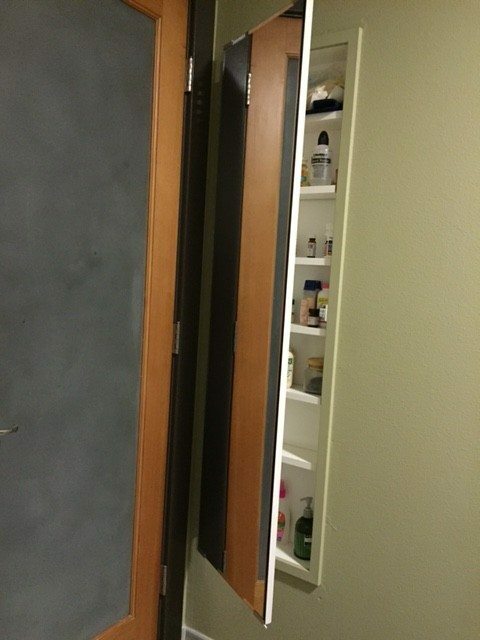 48″ of storage cabinets in upstairs bathroom uses “tweener” space. Upstairs, we fit two spacious cabinets that have pull outs for easier accessibility. The left side cabinet has 3 pull out shelves. Both bathrooms have wonderful 60″ long mirrored medicine cabinets. We built these because we couldn’t find them for sale, but they could be a great addition to any home, fitting between standard interior wall framing. 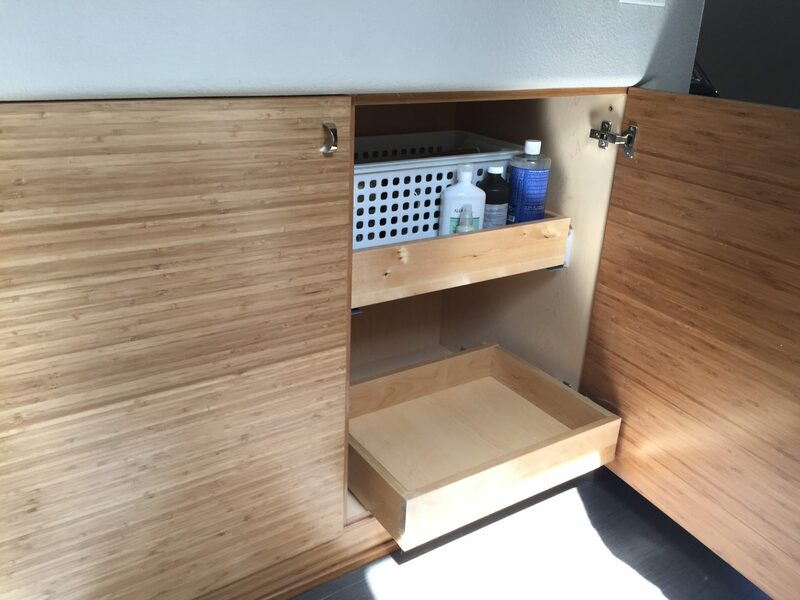 Sustainable = More storage in less space. Deep closet off stair landing. 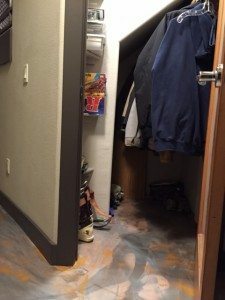 The stair closet, accessible from the landing, has been a handy place to store our suitcases and other miscellaneous travel necessities. large storage area where I have room for off-season clothes and some recreational gear. 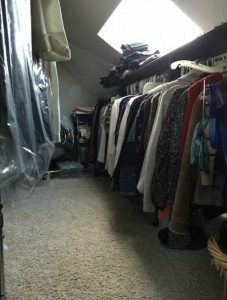 All of this area is conditioned space that is easy to get to when we need something, and allows for good organization so that it’s easy to find what we need. Do you have creative ideas for conditioned storage space? We’d enjoy hearing about what you’ve done. 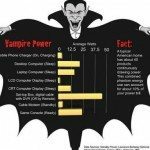 If you know others that are interested in getting more storage in less space, please share this post. 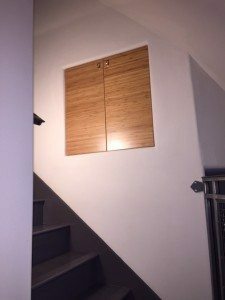 Coat closet under stairs includes entire under stair space.